In this rousing read-aloud, all of insect land is abuzz with news of a big contest! The demure Damselfly Dilly — "neither clever nor frilly" — has no thoughts of winning, but she's curious to see who will. Lively verse mixes fun, fancy, and fascinating fact, while exuberant artwork virtually flies off the page. First, we chose this book because the illustrations were made for you in a little studio on Peaks Island, Maine, by the mighty Scott Nash. His love of insects and arachnids (spiders) shows on every page. Each spread is filled with detailed images of the secret lives of bugs. 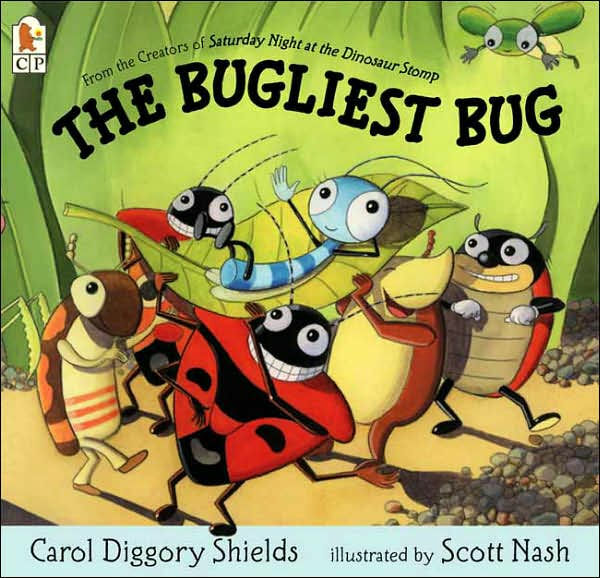 Author Carol Diggory Shields is a master of rhyme, and you and your child will delight in finding all those words that sound great together. Every new read aloud will lead you to discover a new character or a new word. Punch out the cards in the back to learn more about the real lives of these insects. Use them in a game. Can your child match the bugs on the cards to the ones on the page? Your child, like Dilly on the last page, “might be young and she might be small,” but she has grown so much because you have read to her since she was a baby! Bravo! Check out our tips for more ways you can share this book with a child.